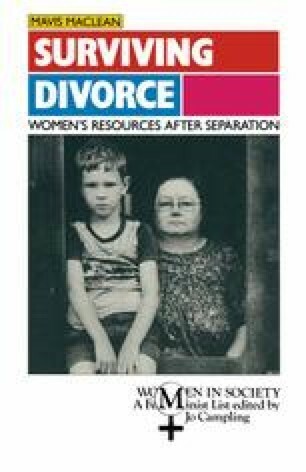 Chapter 1 described how, with increased divorce, remarriage and redivorce, family structures and expectations about marriage have changed as the support networks of kin, neighbours and friends surrounding the partners and their children have decreased. The high rate of marriage failure is not difficult to understand, nor is the difficulty experienced by the partners in coping with the aftermath. Surveys of social attitudes in the UK (Jowell and Airey, 1987) confirm that four-fifths of the population still see the conventional family as the desirable norm, and this is true even for people living in less conventional groups. But to subject this form of social organisation to such rapid change has inevitably led to severe economic as well as social and emotional tensions associated with the changing dependency ratio in each unit, i.e. the ratio of those earning money to those not earning money in each household. Private or family law does little to solve these economic difficulties, partly because it can only allocate resources; it cannot create them. Only social security systems have access to large-scale resources, and here one-parent families benefit at only a minimal subsistence standard of living.